Now we have a procedure reminiscent of the white primary that is being called the "Sheldon primary," as in political bankroller Sheldon Adelson. Republican presidential hopefuls are kneeling at the feet of the casino magnate in the hope of receiving his blessing, and thus his money, as the party's nominee for 2016. 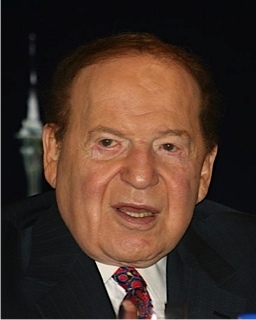 It seems that Adelson who, together with his wife, dropped $93 million on political campaigns in 2012, has concluded that he erred in that year in backing for too long candidates whose ideology appealed most to him but ultimately proved unelectable. This time he wants to anoint early on someone he can stick with right through the general election. He doesn't want to see messy primary contests that would weaken the eventual nominee. If things work the way Adelson wants -- and that he is willing and able to pay to make them work that way -- caucuses in Iowa or the primary in New Hampshire will matter less than the Sheldon primary. Last time he let us have a good hard look at the likes of Newt Gingrich while votes in Republican primaries still meant something. Next time he doesn't want primary voters to have that much of a choice. For this man who will likely have such enormous influence on who will be the Republican presidential nominee, the Republican Party isn't even his first love among political parties. That would be the Likud party. Adelson's money also plays a very big role in Israeli politics, much of it in subsidizing a free-distribution newspaper, Israel HaYom, which has the largest circulation of any daily newspaper in Israel and functions as a cheerleader for Benjamin Netanyahu and Likud. Nor is the United States Adelson's first love among countries. He has said that when he performed military service as a young man it "unfortunately" was in a U.S. uniform rather than an Israeli one. He has expressed the wish that his son become a sniper in the Israeli Defense Forces. Adelson's biggest push for, and most lavish financing of, a domestic U.S. issue is his attempt to get online gambling outlawed. The ostensible purpose is to protect the morals of our youth, but of course it also would protect the market share of his casinos. Adelson's most distinctive foreign policy pronouncement is that a nuclear weapon should be dropped on Iran. Even if that mistake cannot be corrected, voters -- including those Republican primary voters in New Hampshire and elsewhere -- ought at least to be fully aware of what type of man is trying to use his wealth to make their choice for them.